When you buy a stock you’re buying equity or ownership in that company. Public companies are owned by the shareholders. When you purchase a share in a company you’re purchasing a claim on that company’s earnings and assets. The stock market places stocks in what I like to call categories. Stocks are placed in categories based on a company’s size, market capitalization, growth patterns, and sector. In terms of market capitalization, stocks may be categorized as large-cap stocks or small-cap stocks. 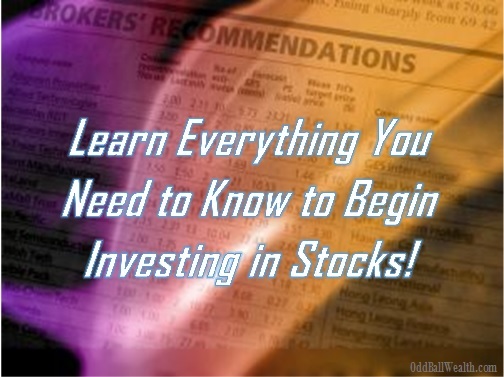 If you’re looking for stocks based on sector, stocks may be categorized as technology stocks or energy stocks. The market value of a stock’s price can be determined in weird ways. Over the long-term, a stock’s market price is generally based on the fundamentals such as its earnings. In the short-term many factors can determine a stock’s market value, such as fear, wars, the economy, and the media. Historically, investing in stocks has been the best way to guard your investments against inflation. In fact, compared to other investments like real estate, bonds, and basic savings accounts for hedging against inflation, stocks have beat them all. A strong stock may go up even in poor market conditions whereas another stock may go down in great market conditions. A stocks past does not guarantee its future. Just because a stock has historically done very well in the past does not mean it will continue on that path. There are many variables that could happen such as a change in consumer behavior and/or preference, new competitors, and new products. Many people think because a stock’s market price is high that it’s expensive, although in reality it might be a good deal. A stock that costs $200 per share might have high earnings potential whereas a stock that cost $5 per share might actually be expensive if it has low earning potential. A good investor will buy a stock that is undervalued. A good way to determine whether or not a stock is undervalued is to look and compare its financial sheets and earnings from the past ten years, and compare the stock to other stocks in its industry, etc. It’s important not to invest all your money in one stock or one sector. By investing in a variety of stocks and sectors, you’re protecting your portfolio in the case one stock or sector drops or takes a big economic hit. Most successful investors buy and hold stocks for the long-term. Don’t get in all the hype of the media, such as fear that a stock might drop. It’s extremely difficult to perfectly time when to buy and sell a stock, which is why you’ll have the most success by buying and holding. Thanks to online brokers, it’s now very cheap to invest in stocks because of low commissions. One very good online broker is TradeKing with a low trade commission of only $4.95 per trade. If you don’t want to pick your own stocks, check out Betterment! Betterment is a low-cost service that will pick ETFs for you based on your age and risk tolerance. You can also learn more about Betterment and their services by reading the review I wrote on them! Great Post! Thank you so much! I have some related information.